The heatwave is upon us and looks set to last. 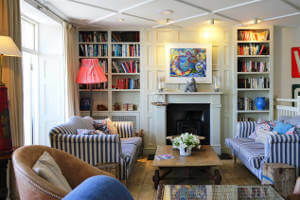 And whilst your fireplace is probably the last thing on your mind, we thought we’d share our top five ideas for easy ways you can keep this focal point a feature in your home throughout the warmer months. By adding a few vases packed full of fresh flowers to your mantle or hearth, you’ll immediately brighten up a room. If you prefer a less manicured look, or want to avoid cut flowers, house plants in terracotta pots add a nice burst of greenery to your living space. With most fireplaces situated in main living areas, you could turn your mantel into a space to record your summer adventures. Display photos from trips to the seaside or of visiting friends, and ask little ones to add trinkets and items collected on days out to complete the display. Arranging a few candles in an unused fireplace can make a room feel cosy at any time of the year. In the summer, why not add a scented candle into the mix? Rose, rhubarb, and nectarine blossom are all in according to The Independent. If you haven’t yet converted an old fireplace into a working one, you could create a mini library by adding a shelf and lining up your favourite books. This is the perfect way for bookworms to ensure their top reads are always close by. Small logs stacked up on one another can make a disused fireplace look loved and requires minimal maintenance. The earthy wood tones complement most interiors, or you could paint the logs to coordinate to your interior colour scheme. And if you’re not a fan of spiders, simply try mounting wooden discs onto plywood backing to create a facade which can be easily removed. This option also allows you to use the space behind for storage – a must in some apartments or houses. Fireplaces, both working and non-functioning, are a feature in every room they’re in. They are great for creating an atmosphere and there is no reason why they shouldn’t continue to do so over the summer. With so many ways to bring your fireplace to life, will you be giving yours a new function this summer? Before you get going, be sure to check that no soot is left over in working fireplaces. Our chimney sweeping service is a good place to start for some customers, whilst a quick spring clean may be enough for others (especially those with non-functioning fireplaces). and we can discuss your requirements and arrange an initial survey. If you decide to proceed you’ll benefit from our expertise all the way through to installation and servicing.